Dr Chris Deacy, Reader in Theology and Religious Studies in the Department of Religious Studies, has just released a new episode of his podcast series on ‘Nostalgia’. 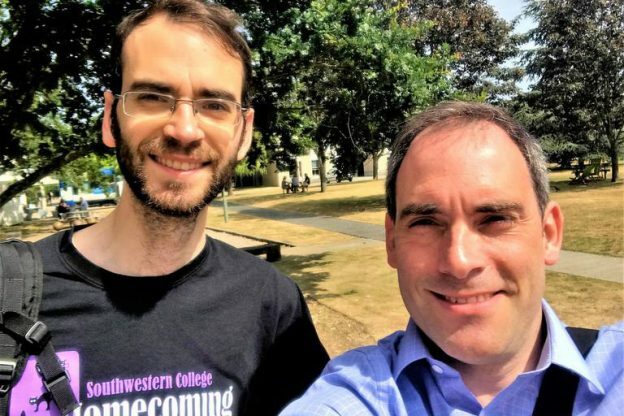 In the latest instalment, Chris interviews Dr Graeme Forbes, Lecturer in the Department of Philosophy, and talks about which other professions he considered entering before becoming a professional philosopher. Before coming to Kent Graeme worked at a small liberal arts college in Kansas which leads him to make a number of insightful comments about the differences between the US and UK university systems. Graeme has also worked for Iceland supermarket, been a delegate for the National Union of Studies, and also has experience of stand-up comedy as well as being a life member of Keele Drama Society. Graeme also discusses his Scottish ancestry and he lets us into the secrets of the ‘wall of suspicious family rivalry’. Graeme discusses the way in which a family member used to speak to him in the form of parables. This is then followed by a wider conversation about the extent to which the lack of religion was an influence on Graeme’s life and how drama was an influence on his philosophical career. Finally, Graeme reveals why he feels the need to be an imperialist when it comes to philosophy and we learn whether, as a philosopher of time, Graeme is a backward-looking or a forward-looking type of person. This entry was posted in Campus online and tagged Campus online, Canterbury on 12 July 2018 by Sophia Cheraitia.